Mystery cache Church Micro 4050...Wells Cathedral, for that note how many figures appear on the 3 pairs of south windows on the church and keep that for future reference. Your looking for a screw top container. Where the cache lays is beautiful country with extensive countryside to explore to the east is Dolebury Warren a 90.6 hectare biological Site of Special Scientific Interest near the village of Churchill in North Somerset, notified in 1952. It is owned by the National Trust and managed by the Avon Wildlife Trust. 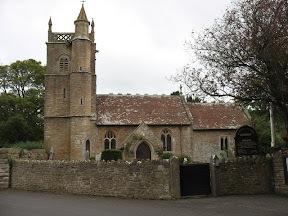 The parish Church of St Michael and All Angels dates from the late 14th century, however the nave, chancel and south porch were rebuilt in 1865. It is a Grade II* listed building. Late C14; nave, chancel and south porch rebuilt 1865. Coursed and squared rubble, tile roof with fishscale bands. Perpendicular. West tower unbuttressed and of 3 stages with a polygonal stair turret; pierced parapet with corner pinnacles, 2-light bell-chamber windows. Two bay nave with a reused 2-light C15 window on its south wall, single bay chancel; 3-light east and west windows with intersecting tracery. Interior on encaustic tile floors, C14 font with a Jacobean cover, royal arms of 1637; C18 oil painting of the crucificion; C19 wall monument by T King of Bath. In the chancel a sedilia and piscina, each with a cinquefoiled head; reredos, 2 Jacobean chairs. Perpendicular tower arch. fragment of an Anglo-Saxon Cross on the north wall of the chancel. Some stained glass of late C19 and early C20. I must make mention of Mind the Horses (and 4x4s) a nice multi also located here. Click here to go to the cache page. Bccbfvgr fvqr bs ebnq sebz lryybj sver ulqenag znexre, va Irr unysjnl hc gerr fghzc va vil. Cyrnfr er-uvqr jryy.